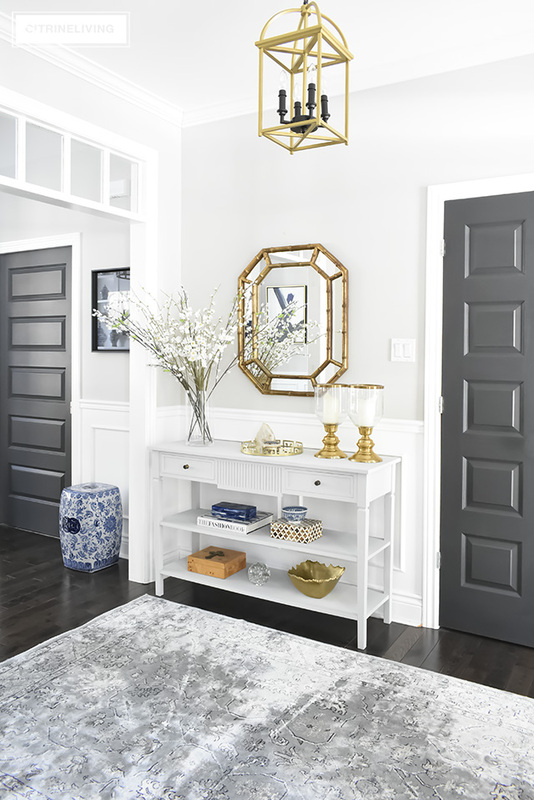 My friends, I’m back again this week, as promised, with my latest organization project in our home. Our organized kitchen drawers. 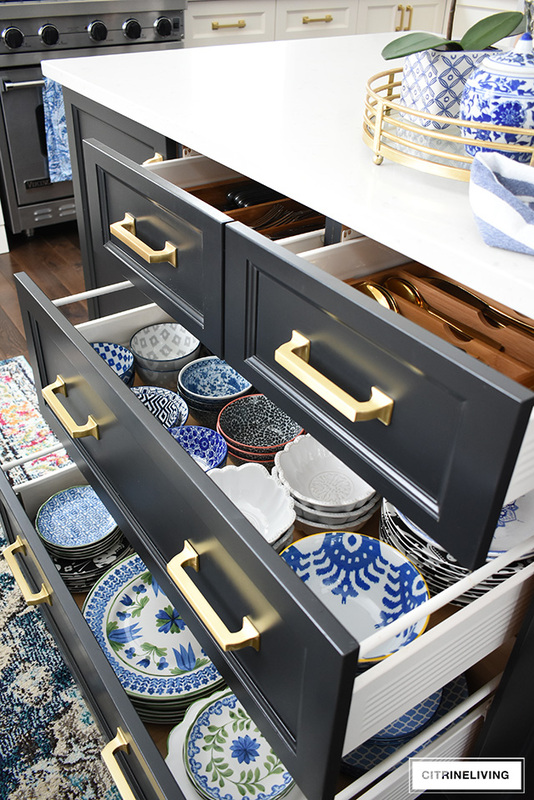 I first shared my plans and quick fix for these drawers two weeks ago (click here to read it), and I’m very happy to report that after clearing out all our of accumulation and clutter – nine years of it – purging, donating, adding organizing containers where needed, I’m finally proud to show them off. The contents may not all be the most beautiful, cute or trendy. Some are years old, and still serve their purpose wonderfully. Some are downright ugly haha. Most important however, is that everything I kept was carefully curated and chosen out of necessity for what serves us. You’ll see further down in this post all of the things that were taking up useful space and serving absolutely no purpose. Well, I am over that! I am so happy that I’ve finally tackled these organizing projects – ones I’ve put off for far too long. They took a little bit of time and focus, some physical and mental energy, and hard work. 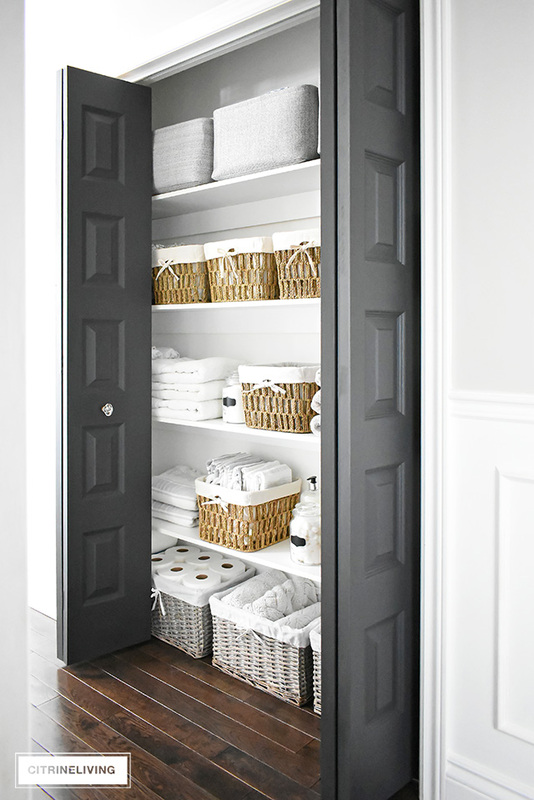 Did you catch my organized linen closet last week? That one is a must read – click here, you want to read this! I can tell you, doing the work is all so worth it. It wasn’t even really as bad as I thought. I’d been putting things off, thinking it would be a daunting task, but in the end, not one bit. 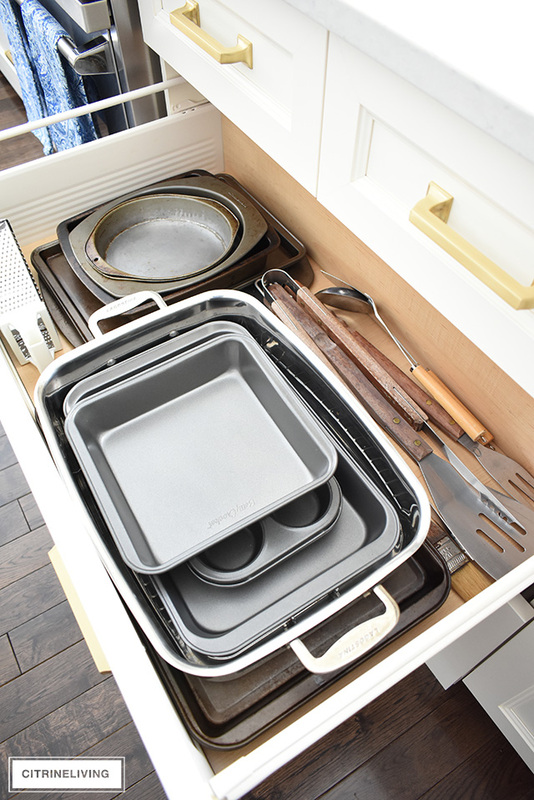 It feels so good to purge and clean out, and I am so excited to share our organized kitchen drawers with you today! I’ll be honest – these drawers weren’t so bad at all. I don’t have before shots to share with you, because they were in relatively good shape to start. 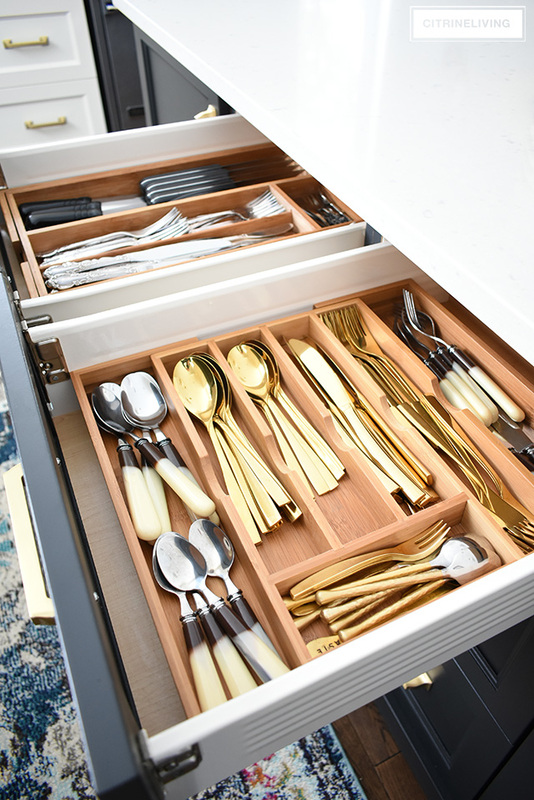 I already keep these drawers neat and tidy, but what I did do, was clear out old flatware that we weren’t using, for my brass flatware set that I had sitting in a plant holder on my shelf. It was one of my blue and white jars, so it actually looked pretty, but I decided it was time to store them properly. I have another, faux horn set I keep in this drawer as well. 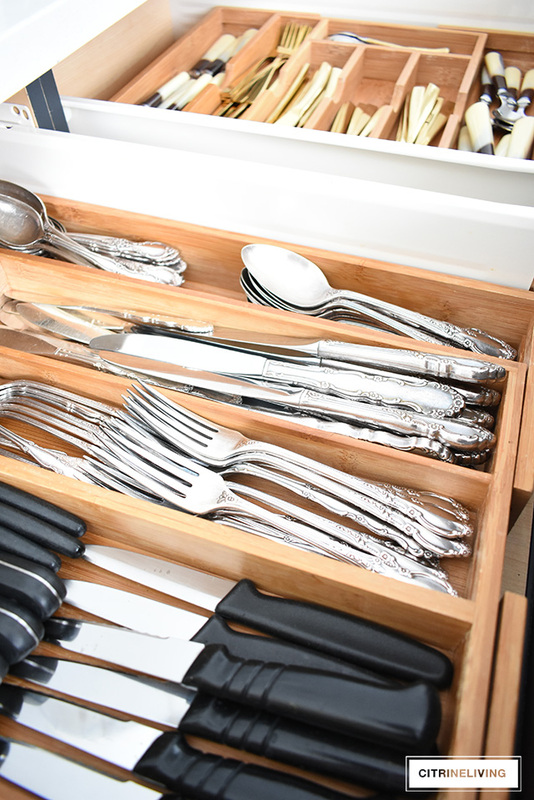 I had two stainless steel sets of cutlery in here, that I’ve owned for about 20 years. We rarely used them and this drawer was overflowing. No use for it? It’s gone – donated to families in need. I’m feeling better already. We use my silver plated flatware that my aunt gave me years ago – this is our every day set and I love it. I already had the bamboo organizers in here, so I didn’t need to purchase anything to get these drawers cleaned up. Next up, the bowls and dishes. Again, these all get every day use, as does everything our island houses. 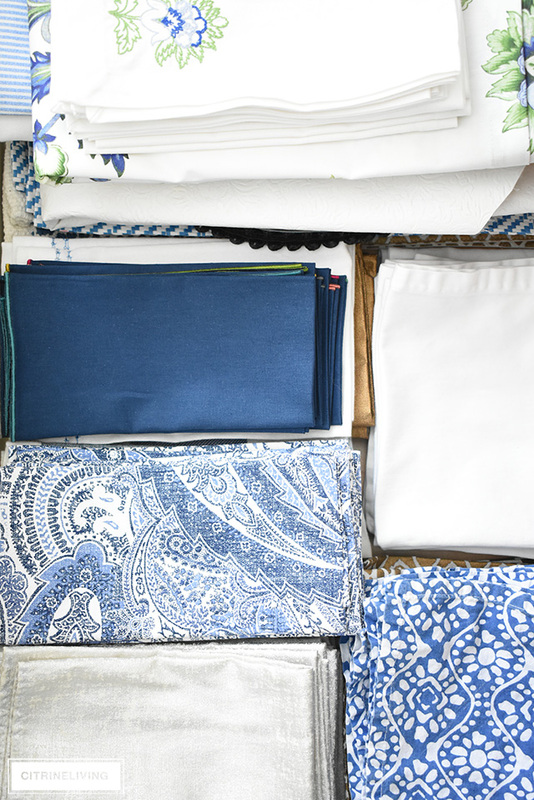 I have several different sizes and patterns – I always love to mix and match. From small ramekins, to large shallow pasta bowls, the bowls are sorted by size, function, and color. 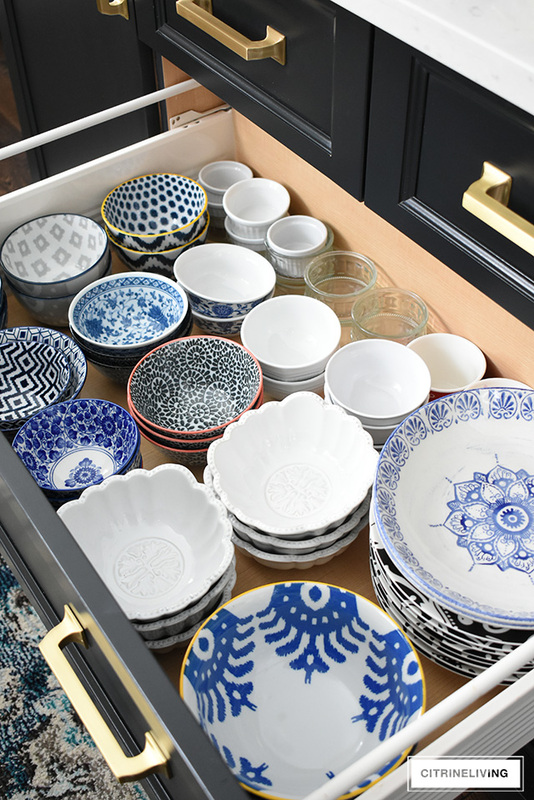 Lastly, our every day dishes are all held in this bottom drawer, and I love to mix and match all of these as well. Those black and white ones still get a ton of use, even after 15 years! I did give away a couple of older sets I wasn’t using, last summer, to make room for my blue and green set from Williams-Sonoma. Don’t you love them? 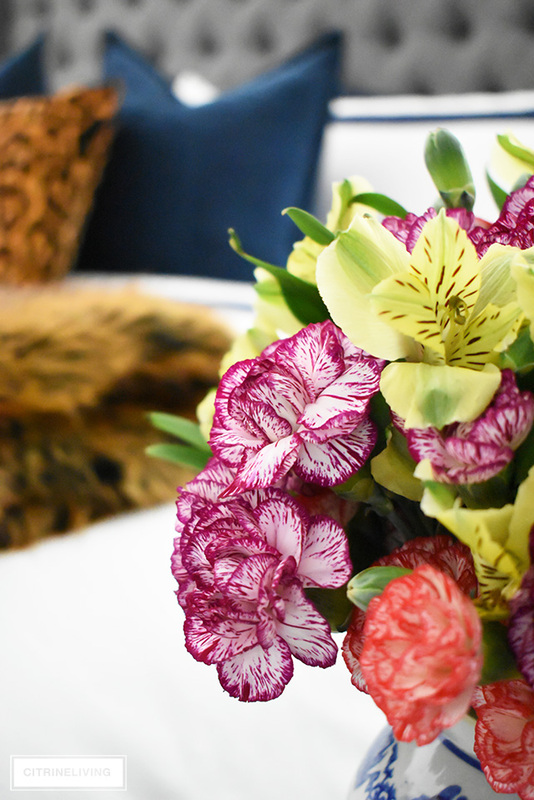 They made their debut on our patio last year – you can read the post here for some warm weather entertaining inspiration! This is where the real clutter was happening, as you saw in my recent post (click here to read it). The top drawers specifically. You’ll see in the next photo what the contents of these drawers were – so much ‘stuff’ for no reason. I cleaned them out, and couldn’t believe what was lurking in there! Out with the old, and keep only what’s needed. My new mantra. Although they’re not the worst drawers ever, they were mostly filled with things we just didn’t need. Creating mess and visual noise for nothing. You should know by now, I like things neat and tidy. Too much clutter, and I suddenly can’t breathe haha. 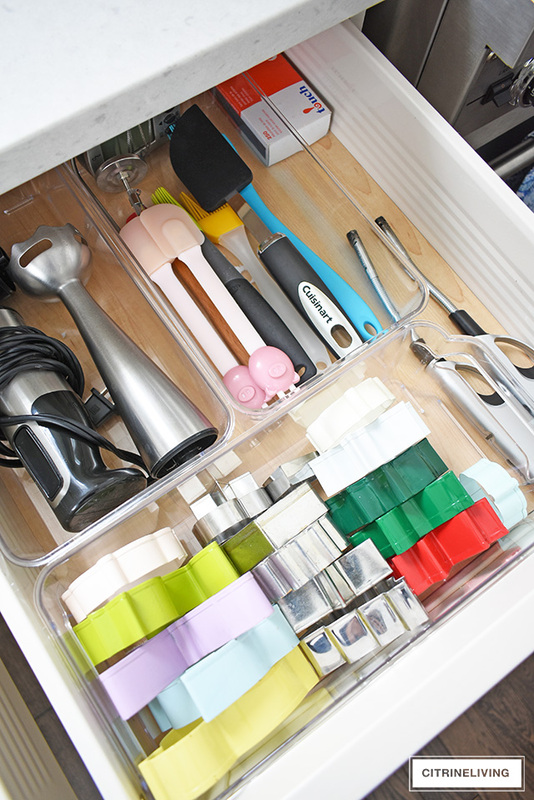 Now, it’s like a breath of fresh air, and I’m loving our organized kitchen drawers. 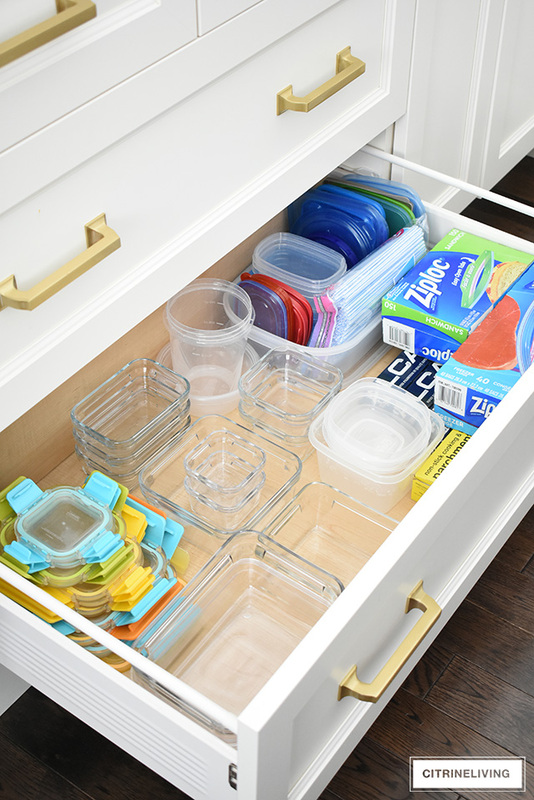 My quick fix : these super inexpensive clear, plastic bins that I shared in my planning post (click here to read it). These saved the day, my friends. Even if you like to keep a lot of stuff, these will be your new best friend, trust me. These two top drawers got purged in a major way – there was just too much happening that really didn’t need to be. Again, I kept only what I needed and what I mostly use. Although, I must admit, I did keep the sushi roller mat and a few extra bottle stoppers that haven’t been used in a long time, but those are items I’ll need again some day, I know it…but, I will say, if they don’t get use in the next 6 – 12 months, they’re gone! I promise. No more accumulation for nothing. 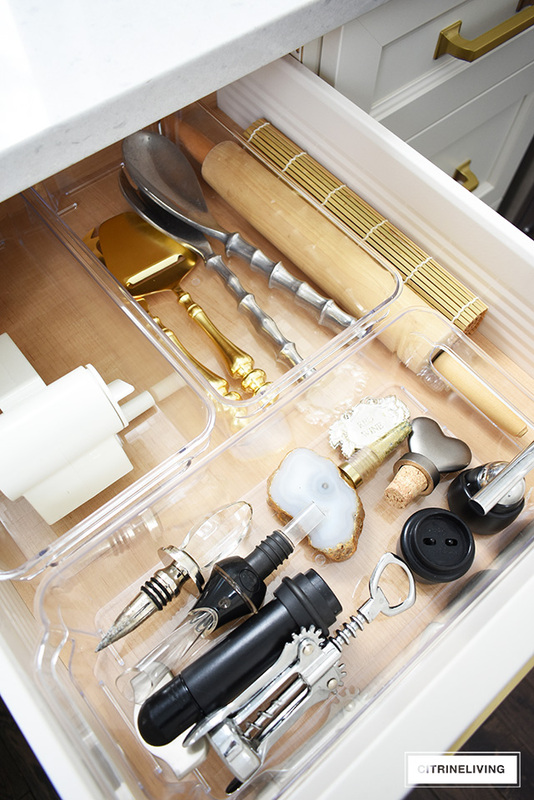 In this drawer, I keep cookie cutters, spatulas, handheld mixer, and meat thermometers – all which get used on a regular basis. Aren’t those little piggy spatulas cute? They belong to my daughter, and I use them all the time! The things that were hiding in here was a little crazy – scroll back up and look if you missed it. The contents of this one drawer was a whole lot of clutter. It’s truly amazing what adds up after years of not paying attention. No longer the case in this kitchen! Like I said, not everything is beautiful, but it sure is well contained, and that’s beautiful to me. I even donated a few old frying pans that were just not getting any use. I had no use for five frying pans. I kept two that I use regularly, as well as my pots. Although, I am overdue for a new set, these do function well, but some copper beauties are on my wish list – or even brass – do they make brass cookware? Something I’ll have to look into! 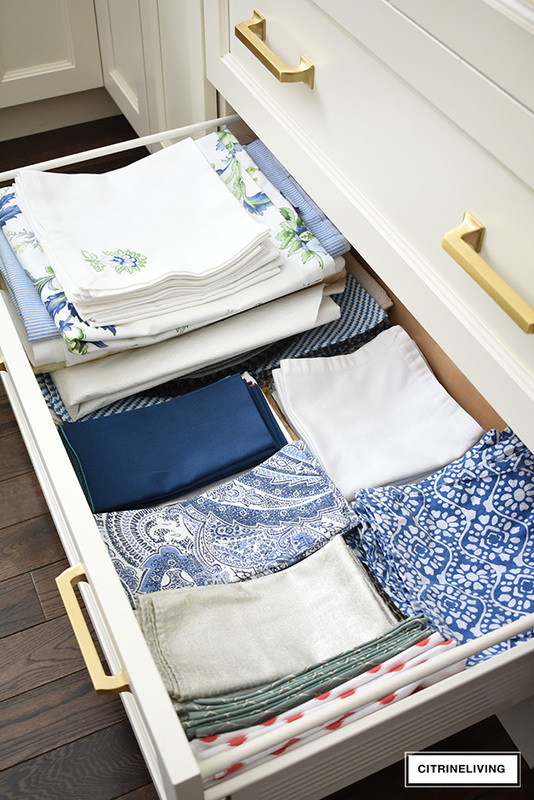 Finally, my linens are housed in the bottom drawer, and I keep a few, less-used extras in the basement storage. I had a tone of extras in here that haven’t been used in a long time, so out they came, and in the donation pile they’ve gone. Remember the before shot of this one? It was cluttered and junky looking, and I cleared out knives that got no use whatsoever and that were years old. That’s all I did. My handy plastic containers saved the day once again – can you believe the difference? The only thing I removed for a nice looking shot, are my ugly orange scissors haha – they didn’t need to be in the picture! I do use them for opening packages, so I kept them. 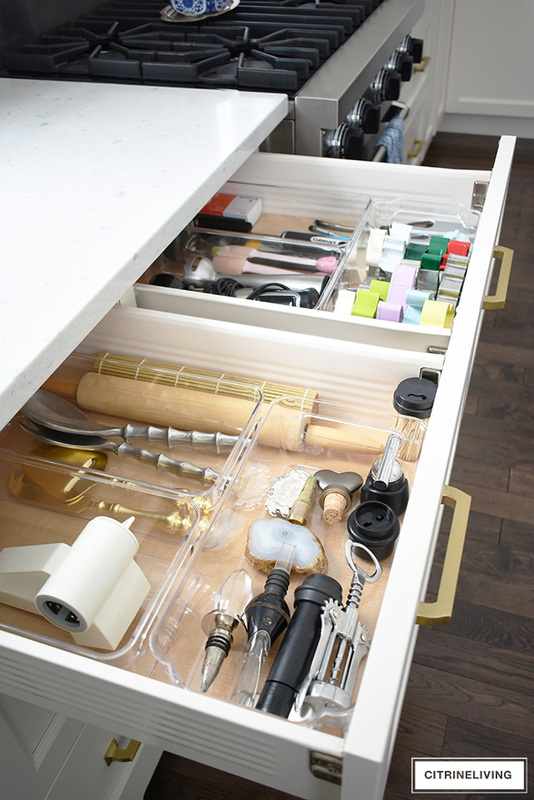 Basically, all this drawer needed was a little bit of order to kick it into full-function mode. I do use my stainless measuring spoons and cups more than the plastic Tupperware ones, but they get occasional use to, so I held on to them – for now. 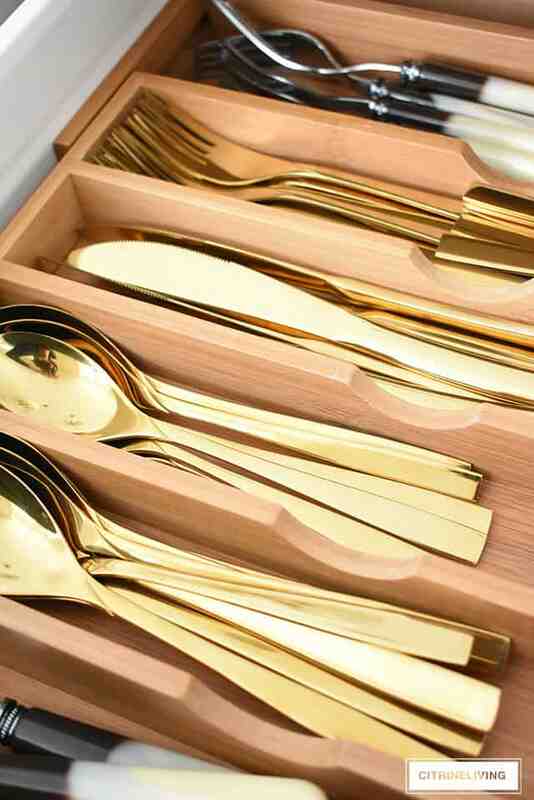 Another wish list item: brass measuring cups and spoons. Oh, and a good quality knife set. Ours aren’t the best, so definitely something I’m looking for. 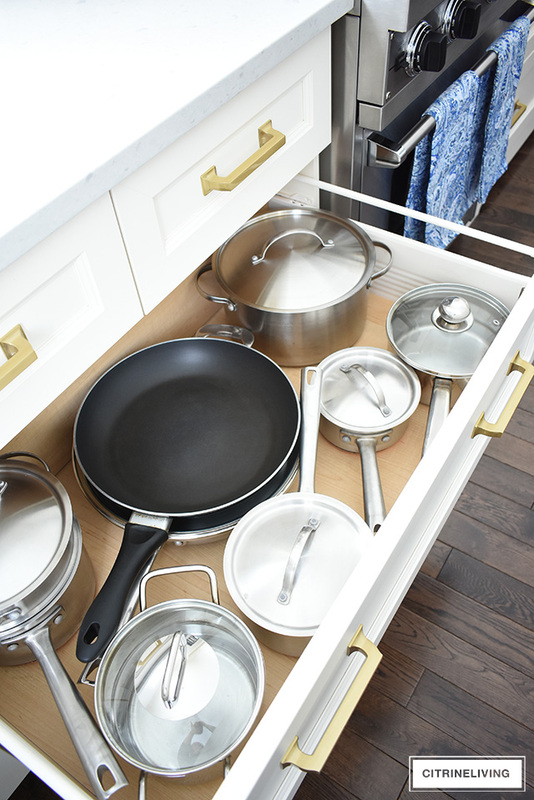 My bakeware drawer was starting to get a little overstuffed too – I purged some old pans that haven’t seen the inside of our oven in many years. Anything that was old, rusty and had no purpose, was cleared out, and I picked up a few new pieces to replace some of the old ones. Next on my list is some new, eight-inch round cake pans – these guys are looking like they’ve seen better days haha. They do get used often though! My kids love homemade two-layer cake. Lastly, is our storage container drawer. Again, it’s not the prettiest, or color coordinated, but it houses all of the necessities that we use daily. I still store cold food in plastic containers from time to time, and also for the kids’ lunches, but I got rid of the bulk of our plastic a few years ago. 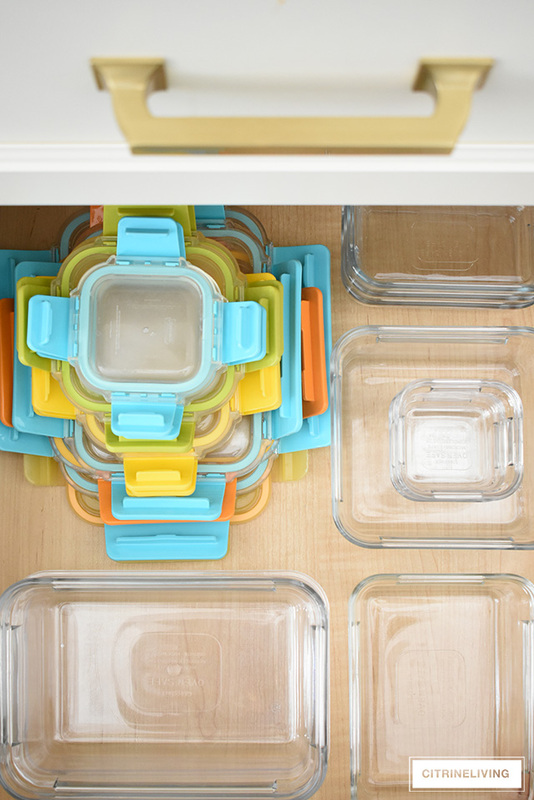 I much prefer keeping leftovers in glass containers, and I love the snap-on lids. We also keep extra storage bags, foil wrap and plastic wrap in here. The upper right drawer on this side holds our wrap and bags that get used daily. These glass containers are the best for food storage – you can transfer hot food and let it cool in the them, which I love, rather than waiting for things to cool first, and having to wash pans later. Much easier for kitchen cleanup. They don’t stain like plastic and they’re better for everyone. It’s amazing what gets housed in these drawers and it is such a great feeling keeping only the necessities. 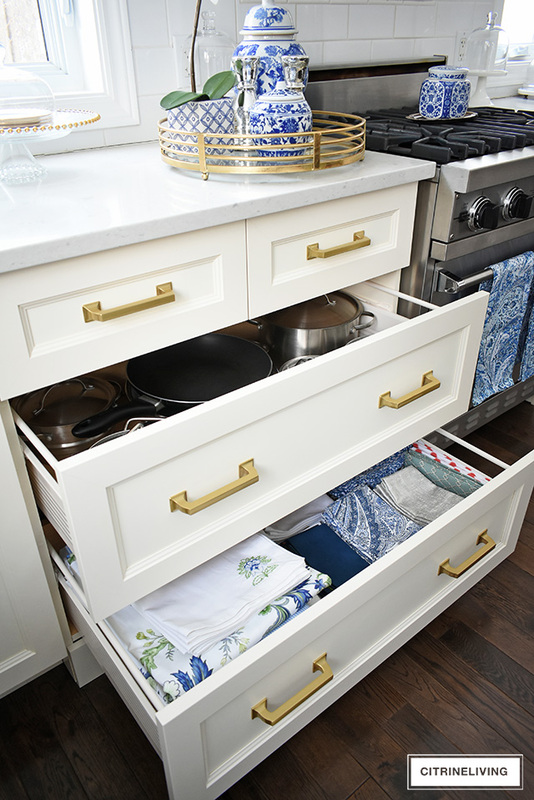 Personally, I prefer having drawers in our kitchen over cabinets – they’re so much more functional, and you can store far more in them. Our next kitchen will have only drawers on the bottom, I love them that much! 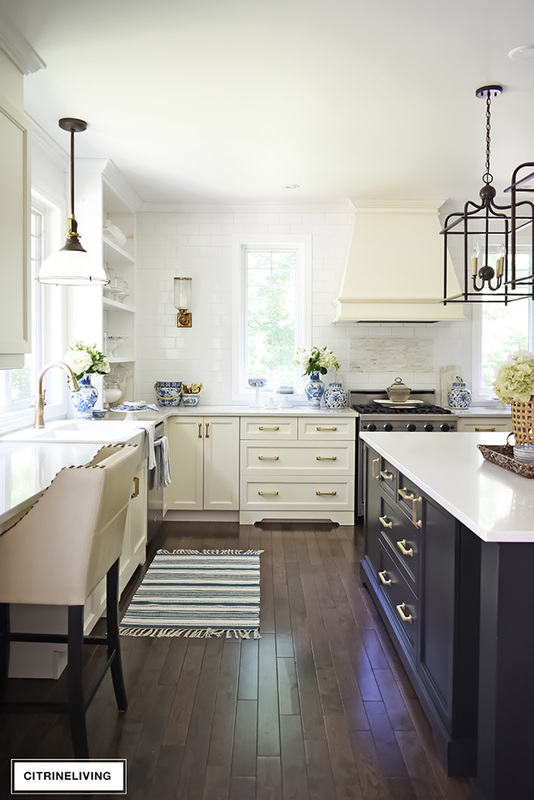 I see that you were so smart when designing your kitchen and used a lot of drawers. I so wish I had used more when designing our kitchen 26 years ago. My builder thought I was crazy using the number that I did, but today…not enough. I really think I’d have every area under the counter with drawers and no cabinets at all. I am short and drawers are just so much easier for vertically challenged people. 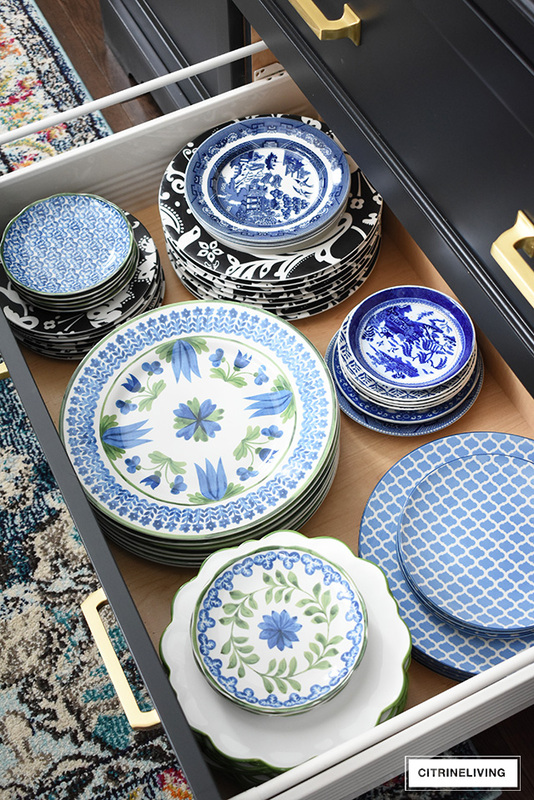 You can never have enough drawers, right?! They are so much easier for people like us haha! 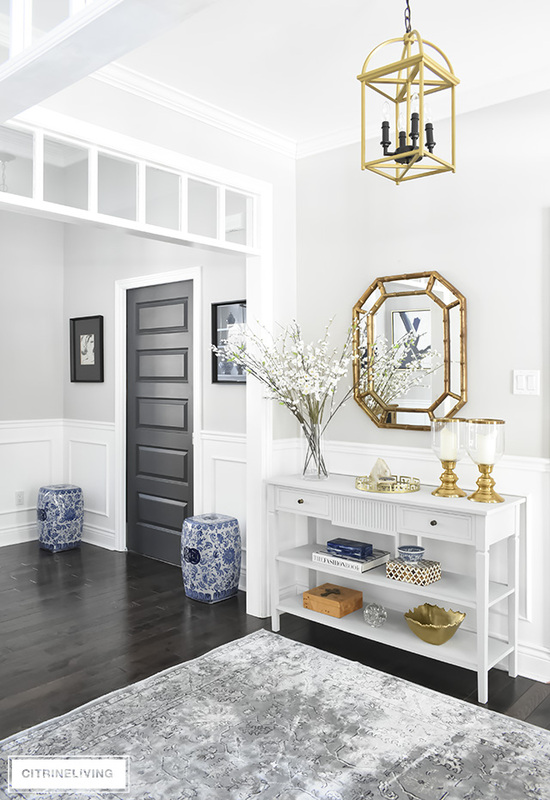 Plus, they hold so much more than cabinets! Thank you for reading with me! I love the way it looks. I recently moved and when we organized the kitchen it was a nightmare! The previous owner used peal and stick floor tiles in every cabinet and drawer. It took my husband and me weeks to get it all pulled up and clean. 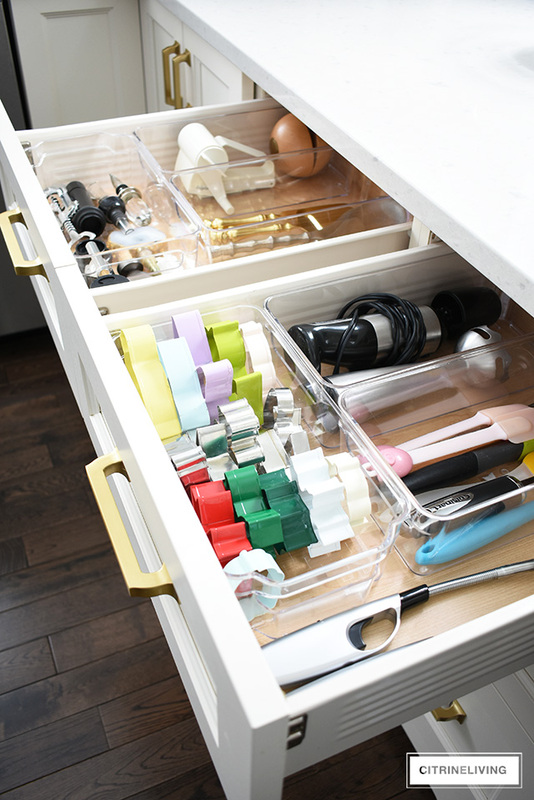 I lined every cabinet and drawer with nonskid white lining with no adhesive and used bamboo drawer organizers everywhere. The results were wonderful and it now feels clean and organized. The point of all this was to tell you about the in drawer knife holder I found. It was a life saver and stores them safely. 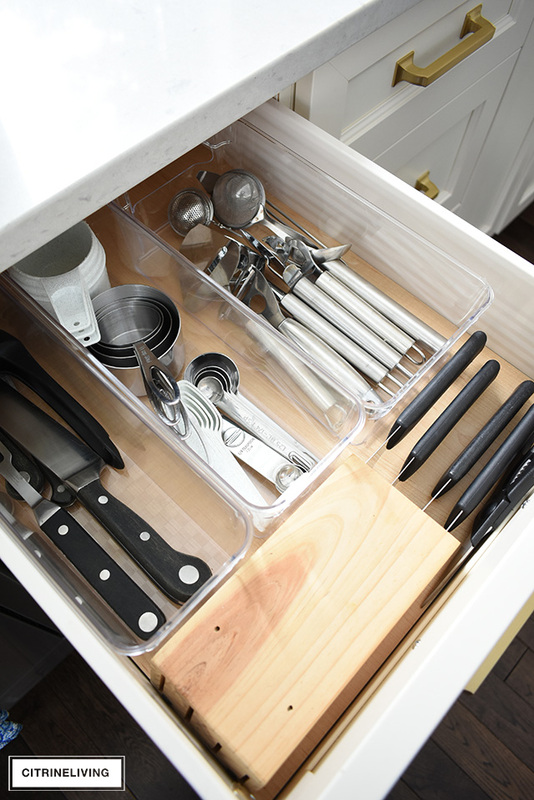 I would recommend them to anyone who has to store their knives in drawers, it holds 11 knives. 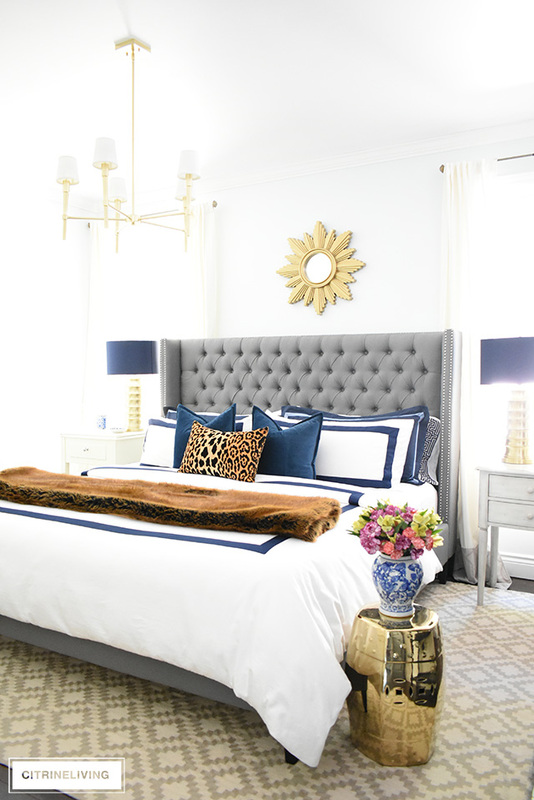 I love it that I found someone who is as crazy about organization and cleanliness as I am. My grown kids think I am a little overboard, but it saves me so much time in the long run and I don’t spend tons of time trying to find things. I always love seeing your posts! I too am vertically challenged, so I love dishes in the drawers. 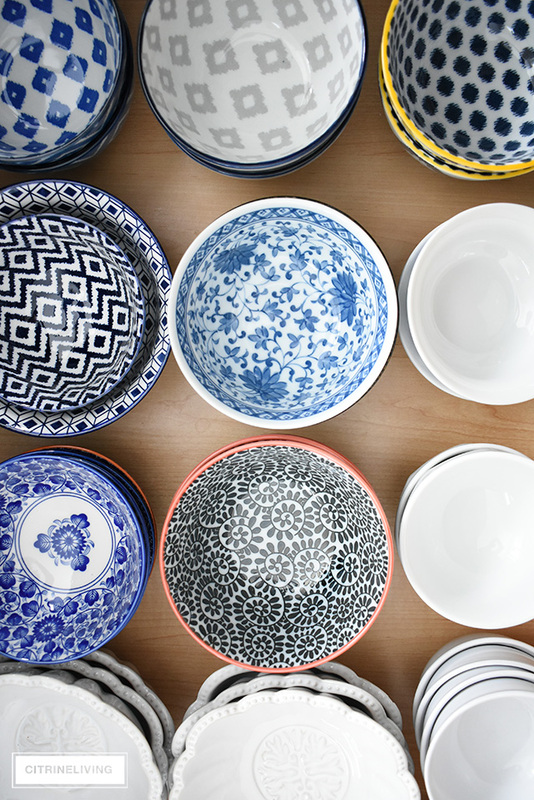 But, my favorite is those blue and white dishes. Thanks for sharing. We all need to purge. Thank you very much, Myrna! 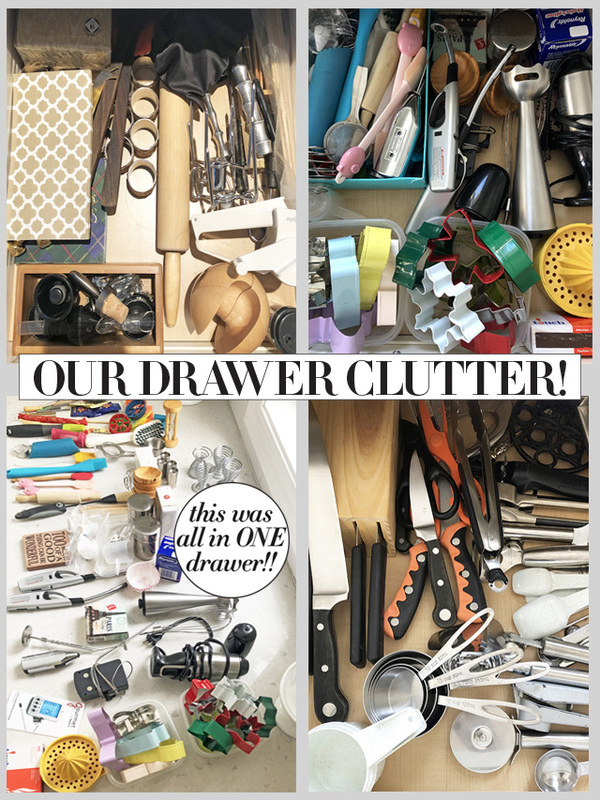 I have to say I love drawers so much better than cupboards! And yes, purging feels so good! Thank you for stopping by! I’ve noticed I’m unable to tap and shop your photos. Defaults to Pin it on Pinterest. Not just this post but on others as well. Love your style! Thanks for sharing and the inspiration! Hi! Thanks so much for your kind words, I’m so happy you’re inspired! They can be tricky sometimes, depending on what device you use. Always click on the bottom of the image – if you click at the top, it takes you to Pinterest. I’m sorry for the inconvenience! This is so helpful–thank you! 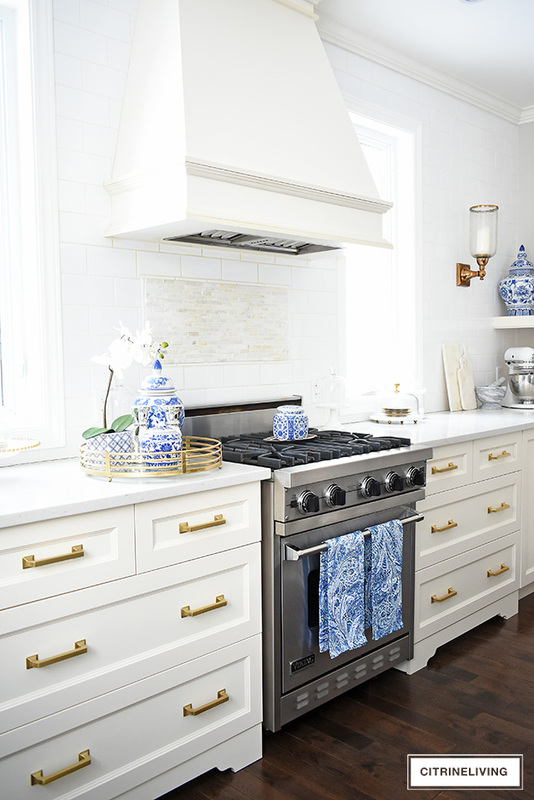 Your kitchen is gorgeous, especially love the mixed metals with the hardware and stove. 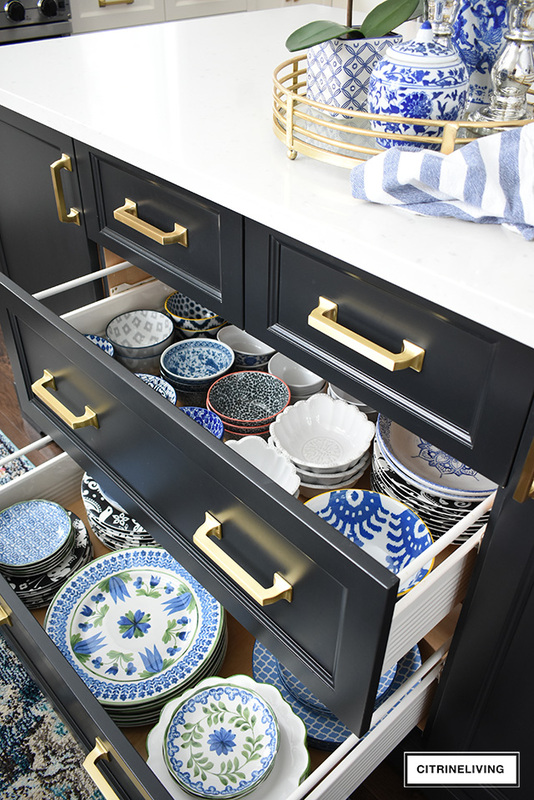 Are you able to share the resource for the drawer pulls? They’re exactly what I’ve been looking for. I am so happy you found this helpful! What a huge difference it has made for us! For some reason I forgot to link my hardware in my post, but I just updated it. Here is a direct affiliate link for you: https://rstyle.me/n/c35g6tb5qaf – thanks so much for reading with me!